- It adopts the continuous charging type as with the Mono Block Type. - It has a wide-ranging charging area with accuracy. - In-Cap Stopping and Out-Cap Capping are available through vacuum. - A simple structure makes the size replacement far easier. 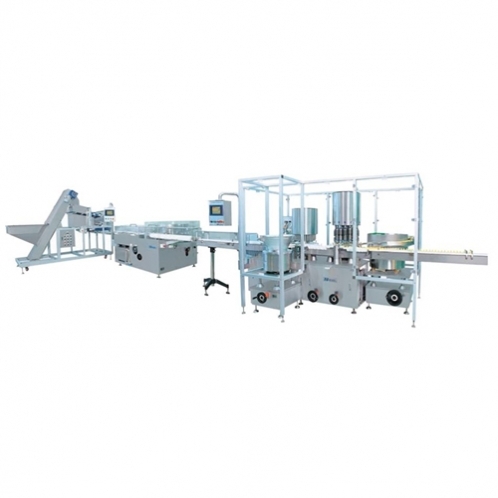 - It adopts the Servo Flow Control System for accurate charging amount. - Charging parts are manufactured in STS 316L. - Multi-phase charging can be available depending on a product and the content won’t overflow. - Adjusting the amount of charging is made highly simple and easy by the program. - It offers a simple operation by the Touch Screen feature.